Frankenstein, Birth of a Myth is a beautifully hand painted narrative driven experience that recounts the origins of Mary Shelley’s masterpiece as she discusses an idea for a novel with some friends in a villa by Lake Geneva during the Summer of 1816. 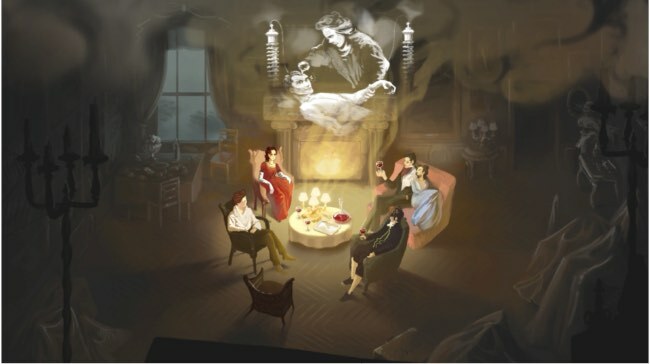 Frankenstein, Birth of a Myth is a prequel to the upcoming game The Wanderer: Frankenstein’s Creature and sees Mary discussing an idea she’s had for a novel around a fireplace with her family and friends. With Mary is her sister Claire, John Polidori (author of The Vampyre), Lord Byron and Mary’s controlling husband, Percy. As you sit around the fire you choose dialogue options that alter the narrative while providing some insight into Mary’s life, the misogynist time she lived in and her inspirations for one of literature’s most iconic monsters. As well as the fireside chats with Mary’s friends and family, part of the game also sees you controlling Mary Shelley’s creature as it explores the world it’s just been born in. As Mary’s novel isn’t fully formed yet, the creature you control isn’t quite the Frankenstein’s monster we all know, but it does share the same core traits that made the story so powerful. This isn’t an evil monster – it’s a child-like creature that’s been born into a human world. It’s not good or evil, it’s just an inquisitive soul that’s craving knowledge about the world around it and what its place in it is. As it sets out you know that this poor creature is doomed, but there’s a real beauty in its innocence and its inquisitiveness about the world. It takes around fifteen minutes to play through Frankenstein, Birth of a Myth and it’s worth playing through multiple times as your dialogue choices can dramatically affect how the discussions play out, giving you lots of great insight into Mary Shelley’s life and her inspirations. The artwork is beautiful and the story is as gripping as Mary Shelley’s masterpiece. Highly recommended.